The SonoStep combines ultrasonication, stirring and pumping of samples in a compact design. It is easy to operate and can be used to deliver sonicated samples to analytic devices, e.g. for particle size measurement. Ultrasonication helps to disperse agglomerated particles for the preparation and analysis of particle dispersions and emulsions. This is important, when measuring particle size, for example by dynamic light scattering or laser light diffraction. 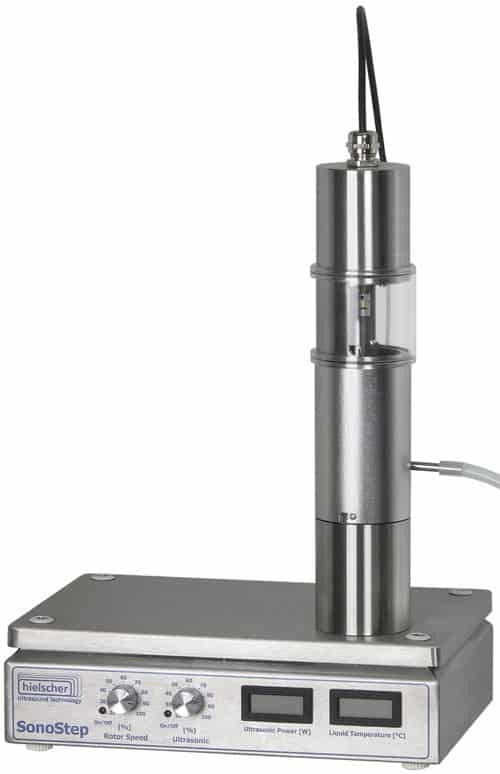 The application of ultrasonic power to a recirculated sample requires four components: a stirred vessel, an ultrasonic generator and transducer and a pump. All components are connected by hoses or pipes. The schematic to the right shows a typical setup. The SonoStep integrates ultrasonic power and a centrifugal pump into an agitated stainless steel beaker. Click at the graphic to the right for a schematic drawing. The SonoStep is connected to the analytical device – that’s it. The ultrasound de-aerates the liquid and therefore prevents micro-bubbles from interfering with the measurement. It circulates the sample volume at an adjustable flow rate and disperses the particles in the liquid. The ultrasonic power is applied directly under the rotor of the pump and ensures that agglomerated particles are getting dispersed before being measured. This leads to more consistent and repeatable results.